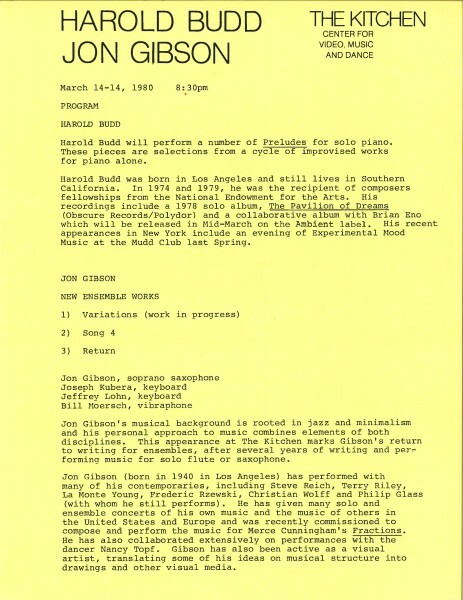 In 1980 The Kitchen presented shared evenings of performance by composers Harold Budd and Jon Gibson. Budd performed his “Preludes,” a series of improvised works for solo piano described as “unashamedly luscious” by Richard Teitelbaum , a fellow composer and writer. Returning to composition for ensembles, Jon Gibson performed his new work “Variations,” “Song 4,” and “Return”.